Quinoa salad with lemon and Echinac Extra Virgin olive oil. Today we bring you an easy recipe, it is fresh for hot days and very tasty. Quinoa salad with lemon and Echinac extra virgin olive oil. The best thing is that you can prepare it with our Echioliva Extra Virgin Olive Oil or Echinac Ecological Extra Virgin , you will only have to decide which option you prefer. Now, let’s go with the recipe. Ingredients for quinoa salad with lemon and extra virgin olive oil. 1 cup or 250gr of cooked quinoa. 1 small tomato cut in small bits. 1 sprig of parsley washed and cut. Quinoa is a food that has a lot of fiber, proteins and a low fat content. In addition, it is especially beneficial for people with celiac disease, as it does not contain gluten. Wash the quinoa: You should wash the quinoa very well before cooking. If it is not washed properly, it usually gives a bitter taste to the food. Boil water: For a cup of quinoa, you need 2 cups of water. Once it is boiling put the washed quinoa and let it cook for about 15-20 minutes. Prepare the ingredients: Cut the tomato in small bits, slice the carrot and then cut the parsley. 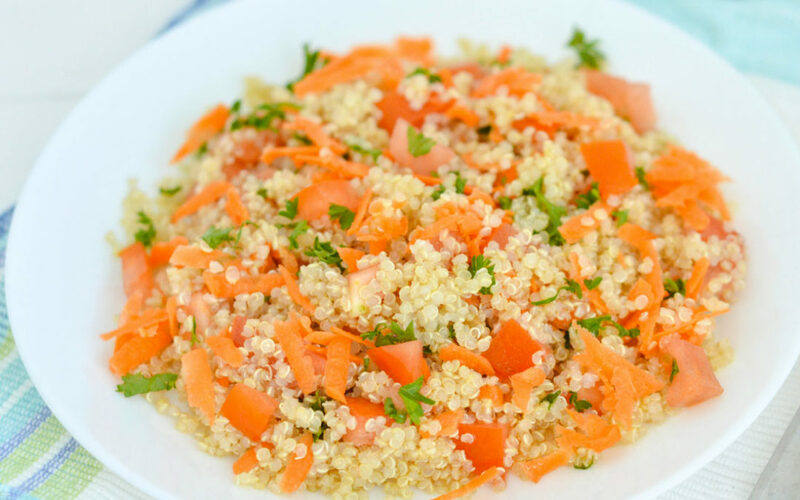 Make the salad: Make the salad by mixing the quinoa with the tomato, the carrot and the parsley. Season: Season the quinoa salad with Echinac Extra Virgin Olive Oil or Ecological Extra Virgin, the lemon juice and the salt. What do you think about the quinoa salad with lemon and Echinac olive oil ? Have you ever made a quinoa salad? Tell us in the comments. Y recuerda que en Echinac somos expertos en aceites de calidad desde 1964. Descubre todos nuestros productos en la tienda. ¡Hasta la próxima receta! And remember that at Echinac we are experts in quality oils since 1964. Discover all our products in the store. See you in the next recipe!